Play the all-new Family Guy Online game! Join Peter, Stewie, Brian, Quagmire and all your favorite Family Guy characters in the world’s first MMLOL (Massively-Multiplayer-Laugh-Out-Loud)! Family Guy Online is a free-to-play, online game now in open beta! Create a custom character and interact with your favorite Family Guy characters and other fans as you adventure through quests straight out of the show. Giggity Giggity Goo! Win Kongregate Loot for Completing the Challenge! Show your Quahog pride all over Kongregate, including a Family Guy profile skin! Choose an avatar and get moving. Family Guy Online is now in open beta! Click the button above to play Family Guy Online. 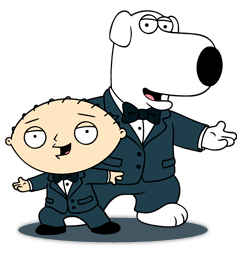 You'll start off creating a custom avatar based on your favorite Family Guy characters. After creating your character you'll be able to hang out at the Drunken Clam, chase the Greased Up Deaf Guy, and rescue midgets from wells! Mayor West is waiting to welcome you to Quahog!